Innovative Press-Fit molded comfort liner system provides a smooth inner chassis for max comfort. Adjustable waist buckle closure system. Level 1 back protector constructed to reduce impact energy transmission. Stone shield chest panel constructed to reduce impact energy transmission. Strategically placed ventilation parts for maximum cooling. Refined fit for maximum deflector coverage. Biofoam shoulder pads with fully integrated adjustable strap system for proper fitment. Stone shield tested and certified according to European Standard EN 14021:2003. Back protector tested and certified according to European Standard EN 1621-2:2014. This was the first chest protector I've had and it fits well and is comfortable, even to wear with a camelback. I'm a skinny guy 6' 160lbs, had to tighten up the straps a little but the medium/large size fits my frame very well. Great protection. A bit too wide at the top. It rubs against the tops of your arms when you reach forward. It's okay though when in riding position. Fits great and easy to adjust. I like it! Looks cool, and not to bulky. Haven’t tried it yet, but will soon. Great for the price. 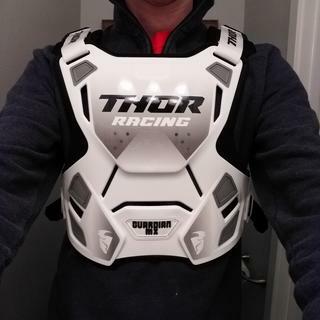 I was looking for chest protector that I could use over or under my jersey. This one seems like a good choice for me. Nice rooster for the price. I got the white rooster in M/LG. I have a very slim/tall frame and it is always a concern to get things that will fit me properly. I just had to tighten the side straps and it fits snug. Protects my entire rib cage. Plenty of ventilation in the front and the back. Having the white rooster reminds me of Stormtrooper armor. 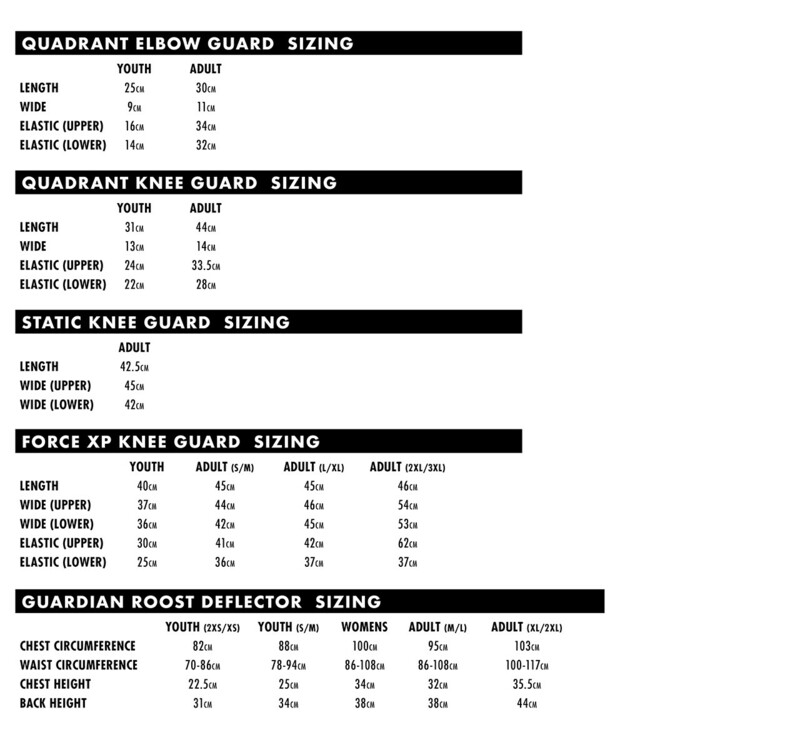 don't know what size to get for the guardian roost protector I weigh 210 any help would be appreciated? BEST ANSWER: Below is the sizing chart from Thor. The chart for this roost deflector is at the bottom. You will need to take your measurements. I am also 210 and 5’11. I bought the medium/Large and am very happy with it. It’s very adjustable so you can fit it to you. Not sure if this will help, but I purchases this for my 9 year old son who is big for his age (5'1" and 135 lbs). We ended up getting the Medium/Large which fits him good with room to grow into. Definitely Lg/ XL. My son weighs 155lbd and the med/lg firs him nicely. 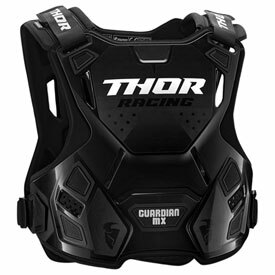 How good to these chest protector hold up? BEST ANSWER: I returned mine after i saw how the straps connected the attachment pin looks like it would wear out fast causing the straps to pop loose possibly, i like the ratchet design on the sentinel better, but i purchased a leatt 4.5 for better protection. The chest protector held up perfectly. Been hit with plenty of roost so far and no damage to it yet. Still looks brand new. This chest protector has held up well so far. I like it and it's easy to adjust and light. will the leatt GPX neck brace work with this? BEST ANSWER: This will work with the Leatt neck brace.